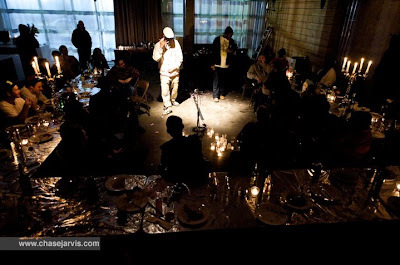 the microphone was cast aside – glassware hit the ground – the punchbowl weighed heavy, candles flickered – and a four hour session of straight forward, engine-hot-rhyme dropping took hold of the room. it couldn’t be stopped – stripped bare – only a few occasional beats from the turntables – and just one damn fine poet after another gathered the room and laid it down, smack down. the gravity of the room was deeply cut – and the community was on. for more than a year we had been trying to put this night together, as we’ve long known that seattle has one of the most vital and important hiphop communities in the country. we owe gratitude to charles mudede, renowned filmmaker, intrepid civic philosopher, and poet of the city for the spark to take this on; and we owe even greater thanks to sabzi for his help in bringing the night to fruition. here is a teaser... geologic of the blue scholars.... a dozen more performances to come. go to www.songsforeatinganddrinking.com for mas mas mas. goddamn that lamb stew was cracking! i've actually been craving it since that night.